This recipe is adapted from Gourmet Traveller and is exactly the sort of thing I love: a short list of ingredients, easy to make and a blissful broth. I found the original recipe didn’t have as much liquid as I like. Because I usually reheat it, I make it with their recommendation of 3 litres of water and then add boiling water to it when I’m eating the leftovers. The taste is good enough that it isn’t diluted.Don’t freak out about the peppercorns. They are strained out after cooking and give a beautiful warmth. As a non salt user I found it is in need of quite a bit of salt, or some soy sauce. If you want some veges to increase the virtuousness, I’ve added mushrooms and bok choi at the noodle stage. I have left out the chives and parsley to keep things simple. I know the parsley adds freshness (and vitamins A and C), but sometimes you just want to wallow in stuffy goodness. Garlic’s another good optional extra. 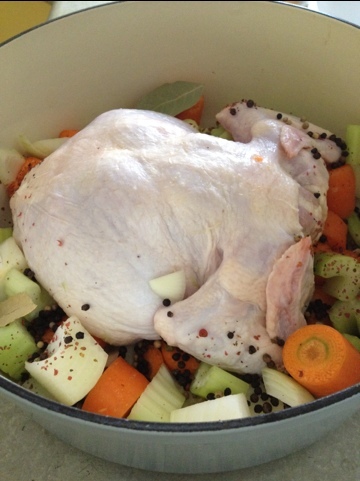 Place chicken in pot with vegetables, bay leaves, peppercorns and 3 litres of cold water. Bring to the boil, then simmer for 1 hour. Remove chicken from pot. Remove skin, coarsely chop meat. Strain liquid into a clean pot and discard vegetables. Bring liquid to the boil, add vermicelli and simmer until tender. Add chicken meat. This entry was posted in RecipeForSuccess. Bookmark the permalink.